Convicted prisoners in Scotland would not be given a say in the independence referendum, even if the law was changed to allow inmates to vote in elections. The Scottish government said that the European Court of Human Rights ruling on prisoner voting, being considered by MPs, does not apply to referendums. In addition, ministers say they do not agree that convicts should be able to vote while locked up. 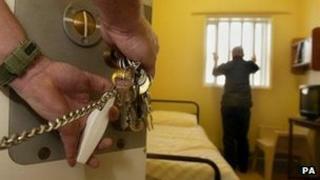 The UK government has unveiled options to allow some prisoners to vote. or giving it to those serving up to four years. The Tory minister said it was a bill that would apply to England and Wales but changing the law would have to apply across the UK. He said the government would "engage" with the devolved administrations to ensure the legislation applied correctly to Scotland. Labour's Willie Bain sought clarification from Mr Grayling on whether the Scottish government intended to allow prisoners the vote in the independence referendum. A spokesman for the SNP administration at Holyrood said: "The Edinburgh Agreement confirmed that the franchise at the referendum will be a matter for the Scottish Parliament to determine when it considers the Referendum Bill." He added: "The Scottish government does not agree that convicted prisoners should be able to vote while they are in prison." The prisoner vote bill will now undergo detailed pre-legislative scrutiny by a parliamentary committee, and Mr Grayling said he could not be sure when the options would be put to a vote in the Commons. He estimated that there were 30,000 prisoners, including 4,188 burglars, who could get the vote under one of the government's proposed options. As part of its obligation as a signatory of the European Convention on Human Rights (ECHR), the government must make clear by 16:00 GMT on Friday how it intends to comply with the judgement. The Council of Europe - which oversees the ECHR - has said the UK is obliged "to introduce legislative proposals to amend the electoral law imposing a blanket restriction on voting rights of convicted prisoners in prison and achieve compliance with the court's judgement". In February, MPs voted by 234 to 22 to keep the blanket ban, in response to a government proposal to give the vote to offenders sentenced to a custodial sentence of less than four years. The draft bill is understood to refer not just to prisoners' voting rights in general and local elections in the UK but also to elections to the European Parliament.